Phytoceramides with Astaxanthin by Bu Sofi is an anti-aging supplement that is reputed to help in fighting all the effects of aging. It is clinically proven in the country of Japan as a supplement which is better than most Phytoceramides products on the market. With the Ceramide-PCD which is extracted from Rice bran, it is famed in that country as the number one leading product that effectively fights the signs of aging. 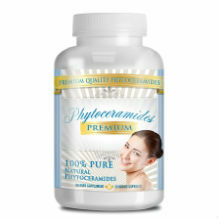 Phytoceramides with Astaxanthin moisturizes the skin and renews it as well. It helps in the retention of moisture and reduces the different signs of aging on your body, making you look younger and radiantly brighter. It is approved by the FDA and is also manufactured in the U.S. It is great for those who are allergic to wheat, since it is rice based. Phytoceramides Astaxanthin is made up of Ceramide-PCD. This comes from the Rice Bran. It has not been made clear how much of the Ceramide is in the product. That is somewhat weird. The manufacturer should outline what is their product so that the consumer is aware of what they’re taking. That is actually it. There is no other ingredient that has been listed for this product. The manufacturer recommends taking one capsule daily for only adults. It is very wise to first research and also consult your doctor before you take this pill, especially without the clarity of what’s in it. NO side effects have been given for the Phytoceramides Astaxanthin. The product is valued for thirty six dollars and ninety five cents, for a 30 day supply. You can get this product online on the Amazon website. There is a sixty day money back guarantee. This is without being clear when the guarantee starts. Also, it does not show much on it’s Amazon page, such as testimonials from other people who may have used the product. When you click on any link that is set up on the page, it does not work or it just directs you back to the same page you were on. Not good. With it’s highly praised name, i would say it’s probably a product of substance. Having the FDA stamp is also a plus. Consumers should know that this product only contains the Ceramide-PCD as an ingredient. It is the only listed ingredient listed on the internet. There are no reviews about this product on the internet. With its well known name, there should be several people by now, who should have given reviews on their experience of using the product. Usually, when customers are satisfied with their product, they want to talk about it. Well, it could have had the opposite reaction, it is up to the customer to decide.